Choosing the right Estate Agent to sell your house is extremely important – it could save you thousands of pounds! After selling houses across Manchester, Cheshire and Tameside for more than 30 years, we know how to provide a service that will surpass your expectations – helping you to sell quickly and for the price you want. Find out how much your house is worth by arranging a free property valuation with your local Edward Mellor branch. You can do this easily by calling 0161 443 4305 or by submitting the online form. Our Valuer will provide you with an accurate figure of what you can expect to sell your property for, and explain how our unique marketing strategy can help you to achieve a fast sale at the best possible price. Once you have decided to market your property for sale with Edward Mellor, contact your Valuer who will arrange another appointment to complete the Agency Agreement and take photographs of your house for the website and brochure. Once the contract has been signed, marketing to sell your property will begin immediately. A professional brochure with high quality photos will be created and your house’s details will be uploaded to the Edward Mellor website and top portals including Rightmove and Zoopla. At the branch, our Sales Negotiators will begin calling to potential buyers with matching requirements to introduce your property and attract plenty of early interest. When an interested buyer wants to take a closer look at your property, we’ll call you to arrange a convenient time to organise a viewing. Our highly trained Negotiators will accompany every viewing so it’s up to you whether to stay in or simply leave us the keys. After the viewing we’ll be in touch promptly with constructive feedback – and hopefully an offer! One of the features of our service that sellers value most is the regular contact to keep you updated on your property’s progress. We talk you through how your house is performing online, viewing feedback , and discuss the best strategy to help you receive that all important offer. Alternatively, we’re always available by phone, email or in person if you need to speak to us. When a potential buyer has made an offer we’ll be in touch immediately. It’s then up to you whether to accept or reject it. If you feel the offer is too low, we’ll get back in touch with the interested party to see if they are willing to increase. Once you have accepted an offer, the sales process can begin. Your file will be passed to our Sales Administration team, whose role is to liaise between you, your buyer, and the Conveyancers to progress the sale of your property in a swift and hassle-free manner. You will need to Appoint a Conveyancer to handle the complex and considerable legal procedures associated with selling your house. You will receive a number of documents from your Conveyancer requesting more detail about your property and also to list what fixtures and fittings you are including in the sale, which need to be filled in and returned at your earliest convenience. 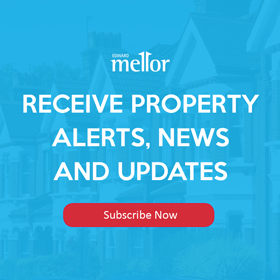 As well as being experts in property sales, Edward Mellor’s panel of solicitors offer an extensive protection policy – meaning that should the sale fall through for a reason out of your control, your legal fees will be reimbursed. If your buyer is looking to have a survey conducted, our Sales Admin will be in touch to arrange a date and time for the surveyor to visit. If any problems are highlighted, we will work with both parties to find a mutually agreeable solution. With your purchase almost complete and both sets of solicitors happy with the contract drawn up, the exchanging of contracts legally binds you to sell the property and the buyer to purchase it for the price agreed. A date for completion will then be set at a mutually convenient time – usually around a week later. In preparation for your completion date, make sure you have removed your possessions from the premises. Once your solicitor has received the payment for the property from the buyer and their mortgage lender and all fees have been paid, they will be in contact to ask you to take the keys into the Edward Mellor branch, where the new owner will then pick them up. The solicitor will then transfer the payment into your account as requested.